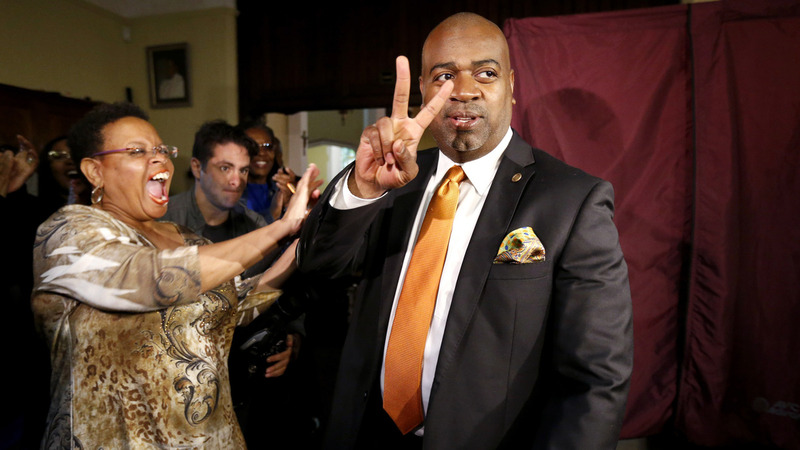 After Cory Booker, Newark Takes A New Turn : It's All Politics Ras Baraka was elected mayor of New Jersey's largest city after criticizing the charter schools and corporate interests that thrived when Booker, the high-profile mayor turned senator, had the job. Ras Baraka (right) is greeted by supporters after casting his vote Tuesday in Newark, N.J. Baraka defeated Shavar Jeffries, a former state assistant attorney general, for the mayoral office Cory Booker occupied from 2006 until October 2013. It's not Cory Booker's city any longer. In Newark's first mayoral election since the Democratic senator left for Washington, voters picked a progressive candidate whose election signaled a break from both the Booker era and the period of dominance Republican Gov. Chris Christie has had over New Jersey politics. Ras Baraka, a city councilman, won election as mayor Tuesday after running a populist campaign that had strong support from unions and other groups on the left. "We are the mayor," he declared in his victory speech, echoing a campaign slogan that promised, "When I become mayor, we all become mayor." His victory over Seton Hall law professor Shavar Jeffries was taken as a signal that the city was rejecting the corporate interests that thrived in Newark while Booker was mayor. Jeffries had the backing of Wall Street figures and organizations promoting charter schools, as well as prominent Democratic leaders in a state where machine politics still matter. The groups aligned with Jeffries outspent Baraka in a local race that may have cost $4 million in total. "That wing of the Democratic Party, the quote unquote progressive wing, was brought to its knees under Christie the last four years," says Bruno Tedeschi, a consultant to the Jeffries campaign. "Their message was, we're going to take it back from them." Coupled with the election of other liberal mayors such as New York's Bill de Blasio last fall, Baraka's victory has some progressives hoping the policies they support will spread beyond local government. "Ras Baraka is, in my estimation, one of the most — maybe the most — progressive mayors that Newark has elected," says Analilia Mejia, executive director of the New Jersey Working Family Alliance, an advocacy group that backed his bid. "What we're seeing from the grass-roots level is this push for more working-family-friendly Democrats." Before being elected to the Senate last year, Booker became a political and social media celebrity as Newark mayor. The Democrat was a magnet for big donors, most famously receiving $100 million to support the city's public schools in 2010 from Facebook founder Mark Zuckerberg. Booker ended a half-century of disinvestment in Newark, helping to attract the headquarters of Panasonic North America and Audible.com to the city's downtown. Prudential Financial has been building a new, $444 million office tower there. But office space in Newark is increasingly going empty. And all the new construction seemed to build resentment in a city where both the poverty and unemployment rates are well above the national average. Murders, in contrast to most other big cities, have been increasing to generational highs. "[Baraka] is looking at ways of doing development that not only create corporate towers but create opportunities for all Newarkers," says Mejia. Baraka has long been critical of Booker. He served as a deputy mayor under Sharpe James, who had beaten Booker in his first mayoral run. What may have turned the tide for Baraka, however, was education. Newark schools have been controlled by the state since 1995. Last year, Cami Anderson, the superintendent appointed by Christie, unveiled an overhaul plan known as One Newark that involves closing and consolidating traditional public schools and laying off 1,000 teachers. Not surprisingly, teachers are not big fans. Baraka, a high school principal, is also opposed and picked up their support as a result. "His campaign certainly resonated with my members," says Joe Del Grosso, president of the Newark Teachers Union. "Yesterday, at the union hall, we had at least a thousand people who were out and about at the polling sites." One Newark would expand charter schools, which already educate a fifth of Newark's children. Since Jeffries helped found and run a large charter school, he was blasted by association with the plan, which he didn't fully embrace. "They turned Shavar essentially into a proxy for Cami and the governor," says Tedeschi, Jeffries' consultant. "Their ability to connect Shavar to this power structure that's trying to impose its will on Newark — that was their successful messaging in certain parts of the city where they were able to turn out huge parts of the vote." The new mayor is the son of the well-known and controversial poet and music critic Amiri Baraka, who died in January. "Newark was Baraka's Dublin," says William J. Harris, his biographer, drawing a comparison with the Irish novelist James Joyce. Ras Baraka is also a poet. He appeared on hip-hop artist Lauryn Hill's debut album and dedicated his 2006 collection, Black Girls Learn Love Hard, to his younger sister, who had been slain three years earlier. He has made crime a central concern, arguing that Newark should emulate other cities in targeting gang violence both through stricter enforcement and with rewards for walking away from gang life. Baraka supported a measure earlier this year that made Newark one of the few cities mandating paid sick leave for most employees at private companies. He also stood last year with workers at the Newark airport who were picketing for higher wages. "The people of Newark were looking for a leader that defies the establishment," says Del Grosso, the teachers union president, "and they found one."